Pádraig Harrington says he's no more inspired to make the 2016 Ryder Cup team than he was before acting as a vice-captain at Gleneagles. But whatever effect of Europe's latest win had on the three time major winner, he shot a six under 66 at Carnoustie in the first round of the Alfred Dunhill Links Championship. It was an important round for Harrington, who is struggling to make the European Tour's season-ending finale at 104th int he Race to Dubai and already added a 2014-15 PGA Tour start to his schedule, next month's the Sanderson Farms Championship, in an effort to win back his card there. Striking the ball well and putting solidly, Harrington finished the day two shots behidn 2008 Ryder Cup player Olive Wilson and matched Shane Lowry, who happily admitted that watching the Ryder Cup action on TV has made him more determined than ever to be at Hazeltine in 2016. Being announced on the first tee at Carnoustie as a former Open champion was enough of a boost for Harrington, who has been winless on the major tours since he won the Open and the US PGA in 2008. And even though the three-time major winner finished bogey-bogey on the course where he claimed the first of his three majors more than seven years ago, he ended the day tied for third with Lowry, just two shots behind Wilson, whose 64 at Carnoustie left him one better than Rafael Jacquelin on the same track. "You go out, your head is down and you're working away and you get on the first tee and the scorer reminds you that you won the Open Championship here, that's kind of nice," said Harrington, who birdied five of the first six holes, picked up another shot at the par-five 12th and then eagled the 14th before errors at the 17th and 18th cost him a share of the lead. "That was a little boost on the first tee box. "That sort of thing is a good reminder. The spectators, that sort of thing, does remind you of good days back in 2007. Every week is a new week on Tour. I certainly enjoyed last week and I particularly enjoyed Sunday night. Maybe my preparation wasn't ideal coming in here on Monday, Tuesday, Wednesday, but I know the golf courses well so I didn't have to play a lot before I got into the tournament to play here. I'm comfortable on them." Harrington's desire to play in a seventh Ryder Cup and put any captaincy ambitions on the back burner until 2018 at the earliest were no suprise to fellow vice-captain Des Smyth. "He wants to play and you wouldn't write Pádraig off, would you?" Smyth said on Sunday. "If Steve Stricker can do it [come back from the wilderness], Pádraig can too." Harrington also revealed that he's set his sights on qualifying for the Olympic Games in 2016. “I’ve got 21 months of results counting towards achieving that goal so I am starting at ‘ground zero’ and working my way up to becoming an Olympic athlete,” he told the Irish Examiner. Harrington might be 324th in the world but Lowry is 55th and keener than ever to make the Top 50 for the first time and set about making his Ryder Cup debut in Minnesota in two years' time. He admitted as much having watched the Ryder Cup on TV last week and a 66 at Kingsbarns puts the Clara man in contention to make that Top-50 move and possibly improve on last year's share of third spot behind David Howell, who shot 70 at Carnoustie. "It was great viewing," Lowry said. "I didn't see much of it on Sunday because I flew home but I saw every shot on Friday and Saturday and it was great and I was delighted for the lads. "To be honest, I was looking at the Ryder Cup and I felt that I really, really wanted to be there. I felt, the way I am playing at the minute, that I was good enough to be there as well. "But it wasn't to be this year. but I think that looking at the Ryder Cup has given me the ambition and the belief to go on and try and make the next team. I really think I can." As for his round, Lowry said: "I'm pretty happy with that. I got lucky a few times on the back nine and managed to make a few good up and downs. It was nice. "I got off to a great start and was six under after 11. I played average enough from there on in but got away with it and managed to shoot six under, which was nice. "It's a continuation of my recent form and I love it up here and love links golf as well. Obviously I have done quite well here before and I've done quite well the last few weeks so I hope I can go out nd do okay — the forecast is bad for the next few days — if I can keep going, keep my hed down and do okat, I can gie myself a chance on Sunday." Ranked 55th in the world, Lowry's goal is to break into the Top 50 by the end of the year so he can secure his Masters debut. And he's certainly on a good run of form since May, sandwiching runner up finishes in the BMW PGA at Wentworth and the ISPS Handa Wales Open between top-12 finishes in the BMW International, the Scottish Open and The Open. "The summer has been very kind to me," said Lowry, who missed six of his first eight cuts this term. "Before May, I barely made a cut and from May onwards, I haven't looked back and it's been very good. I really enjoy competiting and being in contention a lot this summer, gives me the drive to go on and keep doing that. "I finished in Wales and had a company day for one of my sponsors, Bank of Ireland, the following Tuesday and did't hit a ball until this Tuesday. I have got seven of the next eight weeks coming up and I want to be fresh for those. It's paid off and I am still playing quite well and managed to hole a few putts." Leader Wilson, who played in Europe's only defeat this century at Valhalla in 2008, carded a superb eight-under-par 64 at Carnoustie, one of the three courses used for the pro-am event. That gave the world number 792 a one-shot lead over Jacquelin with Harrington a shot further back alongside Lowry, whose 66 was the best score of the day at Kingsbarns. Scotland's Stephen Gallacher was the best-placed of the Gleneagles quartet after a 68, with fellow rookie Victor Dubuisson returning a 71, world number one Rory McIlroy a 73 and Martin Kaymer a 74. European captain Paul McGinley shot 72 in just his second European Tour event since July. Wilson has finished runner-up nine times on the European Tour, including in this event in 2009, but lost his card in 2012 and is currently trying to regain it via the Challenge Tour. "Looking at the forecast, getting Carnoustie out of the way is theoretically the best thing, but you've still got to go and play and shoot a good score to take advantage of it, and I'm delighted that I have," he said. The 34-year-old won one point from two matches on his Ryder Cup debut six years ago - partnering Henrik Stenson to victory over Phil Mickelson and Anthony Kim after being four down - but added: "It's been a while since I played like that, though. "I want to be back there, definitely, and it's inspiring to watch. The boys played awesome last week. You look at the team, they are so strong now, got so many big, big names, big players in there. "It will be tough to get back in there but for me, you watch it and then you come and play a tournament like this, which is fantastic. Dunhill Links is always one of the best tournaments of the year." McIlroy was an approximate eight under par in beating Rickie Fowler 5&4 in the singles at Gleneagles, but managed just one birdie in his round on Thursday. "A little bit flat, if I'm honest," McIlroy said after a round that began with a duffed tee shot that went little more than 100 yards and ended with a laugh on the 18th as he allowed a friendly black labrador to play with his new head cover. "Obviously with the crowds and everything we were playing in front of last week, to come here it seems a little quiet out there, but it was fun to get to play with my dad." He hit just nine greens in regulation with the new Nike Vapor irons in the bag for the first time in competition and added: "I wish I had played a bit better and made a few more birdies but hopefully that will happen over the next couple of days. "I want to win every week and I want to play well this week and at least give myself a chance. It was not the best score out there for me but we got the hardest course out of the way." As Kevin Phelan and Simon Thornton shot one over 73s and Damien McGrane a 75 at Carnoustie, Peter Lawrie shot 70 at Kingsbarns and co-leads the team standings with Kieran McManus on 12 under 60. Darren Clarke posted a 71 at St Andrews where Michael Hoey and Gareth Maybin had 72s. Two mistakes cost Rory McIlroy the Alfred Dunhill Links Championship but while the world No 1 takes three weeks off before the PGA Grand Slam of Golf, Peter Lawrie, Shane Lowry and Pádraig Harrington will be hoping to ride some momentum and end the year on a high. 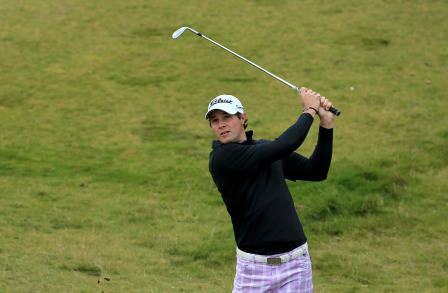 American Peter Uihlein came close to the European Tour’s first 59 at Kingsbarns. © Getty ImagesShane Lowry, Michael Hoey and Darren Clarke are in contention at the Alfred Dunhill Links Championship but the most significant round of the day from an Irish standpoint came from the struggling Padraig Harrington. Shane Lowry, pictured at The Open this summer, is just two shots off the lead in the Alfred Dunhill Links Championship following a course record equalliing 64 at Carnoustie. Picture Eoin Clarke www.golffile.ieLow expectations can sometimes help a player and they certainly worked for Shane Lowry who shot a course record equalling 64 at Carnoustie to move into contention for a win that could catapult him into the world’s top 50. Shane Lowry had little luck with the putter when he needed it on Sunday. Picture Stuart Adams www.golftourimages.com: 25th August 2013A couple of back nine wobbles cost Shane Lowry the Alfred Dunhill LInks title but the Clara man’s share of third at the Home of Golf has made him even more determined to return to the winner’s circle this season.